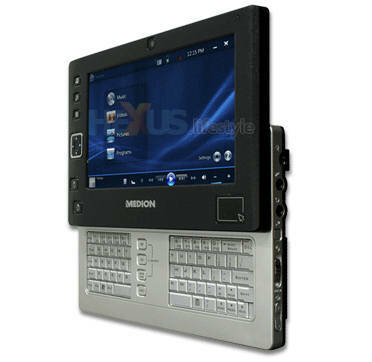 High-quality-PC box-shifter Medion is readying to launch in the UK an ultra-mobile PC (UMPC) - the MD96211 - running Windows Vista Home Premium and priced at £799. That looks pretty appealing until you see how much cheaper Medion will sell the unit for in Germany and the USA. Get the low-down and let us know your thoughts on UMPCs and this latest example of rip-off Britain. Last edited by Bob Crabtree; 20-04-2007 at 05:22 PM. Seriously, WTF, we're paying more than double the US price ? I extremely doubt that the $590 is accurate - there's no way that they would sell it 67% more expensive in UK, I call typo. Maybe the three have been mixed round. I'd buy one at $590 straight away - sweet! The headline was wrong - though not the story. I love the UMPC format and I'm very tempted by the OQO Model 2. However, with news of improvements on the way, I think I'll wait. The &#163;600 price point is perfect IMO, as a trade off for performance against form factor. As a touch-typist who usually hates laptop keyboards, I'm wondering how I'd get on with the keyboard on these sorts of machines. I would genuinely love to have a low-weight laptop with a decent keyboard, simply as a portable note-taker and to give me remote access to the net but I've yet to find anything that seemed to fit the bill (especially in terms of the keyboard) and for which I was willing to pay the bill. you ever tried a proper tablet pc bob? (with a good CPU and ram, too really aid the text recognition). a full slate might be just what you want! They used to have one in the JL in Aberdeen, but i wasn't there today, might have them in other stores. Although they did have one in PC World the other day. Very very tempted with one myself, but i'll wait to see if i can find something in the US in a couple of months. I've been typing since 1980 and have largely forgotten how to write. The last thing on earth I want is to attempt to learn to write again! And, heck, it's just not fair to subject a PC's text-recognition software to my horrible scrawl. My typing is fast and what I want is what I said I want - a low-weight laptop with a decent keyboard. And, since I don't expect to use it a whole lot, I want something that's not too expensive. What I really want is a device in this sort of form factor (pocketable if you're wearing combats) but that has battery enough to last all day, & runs Linux. The Sharp PC3000 had an incredible keyboard, & wasn't exactly substantially bigger, so I know for a fact that small keyboards can be made well - they just seem few & far between at new product launches!